Now, this video will be a bit of a departure from my usual research in that it started off with a dream that I decided to research for its historical context and ended up in a very deep and interesting rabbit hole. To begin, I am a prolific dreamer. I dream stories. I would say that I time travel in my dreams, some may say I astral project and all of that, but I have had some dreams that have historical significance as you will see with this one. So let me begin with the dream. There was a vigilante abolitionist group of folks who called themselves “Rough Riders” (in my dream but actually they were called Missouri Border Ruffians). They were a secret group of people who gone around “killing” slave owners under the cover of darkness. They also killed their family members and loved ones who entered the family. They were greatly feared and mostly white folks. The twist was that there was secret war going on between the abolitionists and the slave owners, so there was retaliation for the dead on both sides. It was such a well kept secret but extremely dangerous in that if a slave owner or member of his family was killed, an abolitionist or one of his family members was killed as well. In other words, folks were dying, mysteriously on both sides. But the mystery was only a mystery to those who did not know about the secret war. In one scene a young man fell in love with a young woman. His father was part of the abolitionist movement but he was not fully invested and the activities that were going on were mostly hidden from him, though there were other deaths in his family, he did not connect the dots. One day he brought home a beautiful young girl, innocent and lovely. He wanted to marry her. The tension in the family escalated but he could not understand why. He later found out. One night, the family gathered around the dinner table. He addressed her but she did not respond. He called her name again and she still did not respond. He got up and went around the table to speak to her directly, and upon gently touching her shoulder, she leaned forward, a long knife had been driven through her. She was dead. The long knife was a sign of the retaliation. The dream continues but I won’t outline it here. These abolitionists called themselves “Rough Riders” way before Teddy Roosevelt had his own, heck they may have been the same folks..
Now, at first I thought it may have been the Nat Turner Rebellion but that happened prior to this event. In my dream, I believe I was transported to Kansas during a time when John Brown was running his campaign against the pro-slavery settlers in Kansas. His campaign was bloody and horrendous. There is so much information to share about this event so I will do my best to get it all together in one place so you can follow the story line. So let’s start with John Brown…. 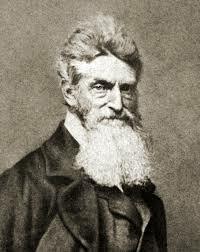 John Brown Facts was born, May 9, 1800 in Torrington, Connecticut. After his failed attempt to capture Harper’s Ferry in VA, he was hung and died, Dec. 2, 1859 in Charles Town VA. He was considered an activist and a famous participant in the Abolitionist movement. Interestingly enough, he was the son of a fervent abolitionist, Owen Brown who was also a known Freemason. 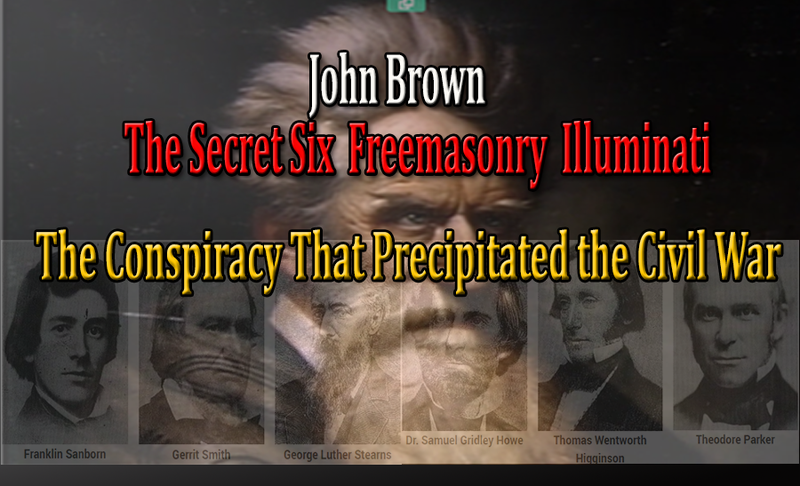 It is reported that John Brown was a Grand Master Freemason from the Hudson Lodge No. 68; Hudson, Ohio; 1824. However, he later quit after speculation that he was involved in the disappearance of William Morgan. There were rumors that Freemasons had kidnapped and murdered Morgan, a brickmason who visited Masonic lodges. The speculation, which Freemasons denied, fueled talk that the group engaged in satanic rituals. Now finding stuff out about John Brown who was called a vigilante, violent killer, terrorist(in fact, this is one of the earlier times this term was even used), a conspirator, murderer, charismatic, hero, abolitionist with messianic leanings, I wondered who helped him in particular, who funded him because of course he couldn’t have done all that damage by himself. When it comes to Brown’s war against slavery, the question of his mental balance must nevertheless be addressed. By the time of the Harpers Ferry raid, some of his contemporaries had already begun to question his sanity. As they insisted, was not the raid itself evidence of an “unhinged” mind? Wasn’t Brown “crazy” to suppose he could overthrow American slavery by commencing a movement on so grand a scale with just 21 active fighters? 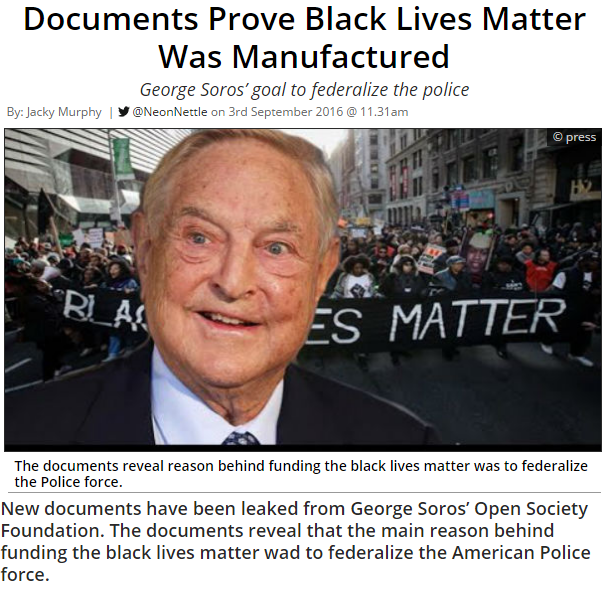 Interestingly enough, I had this dream during the time when it was being exposed that the BLM was funded, indirectly by George Soros. So, upon searching about “vigilante abolitionist group” who were fomenting a secret war, my dream dropped me right down in the middle of an Era in American history that precipitated the American Civil War. Before this time, my facts about the abolitionist movement were sketchy. You got the usual run down of how the abolitionist were anti-slavery they gave speeches, and traveled the country trying to convince others to support their cause. They were outspoken against the evils of slavery, yada, yada, yada, but we were never taught what their true leanings were and why they were so adamant about saving black folks from their southern masters. Researching this topic, gives you another perspective on their motives. Additionally, it shows how the abolitionist who abhorred slavery had begun to become violent against the slave owners to the point of wanting to bring about Civil War. 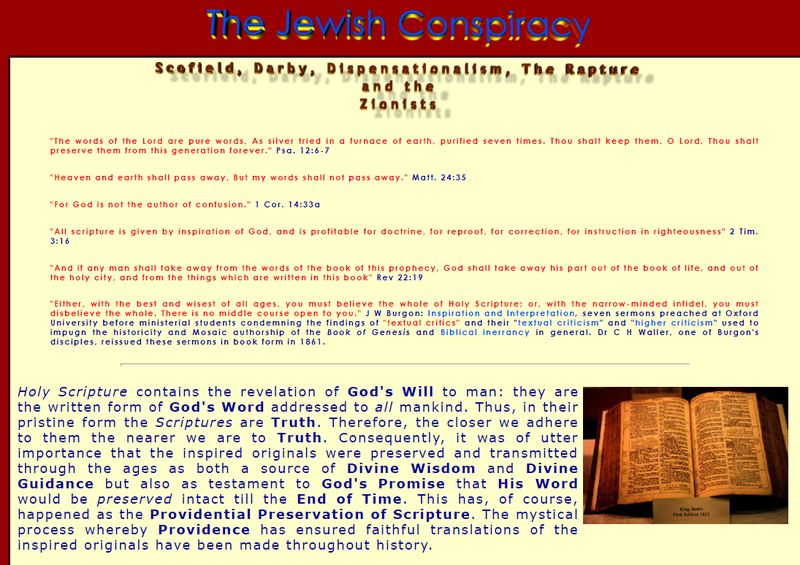 The idea was based in their religious evangelistic perspective which some identified as Zionism, their connections with the Freemason/Illuminati, their wealth and therefore ability to fund the uprisings and their ability to propagandize through print media. Then we land on the group called “The Secret Six”. They came into prominence during the late 1840’s reached a peak with John Brown and is vigilantes and then later support Scofield in the rewriting of the “King James” Bible that has become preferred reading in most if not all Protestant Schools of divinity. Quiet as it’s kept, Scofield was a known con artist, and criminal but he became their puppet for their agenda to continue their divide and conquer tactics way into the mid 1900’s. Needless to say, the same cast of characters that supported John Brown changed faces in supporting but the agenda remained the same. In fact, through their previous experience they learned to send representatives, henchmen and patsies to do their bidding, while they hid in the background providing funds. Sound familiar? So let’s take a look at the “Secret Six”. Who were they and where did they come from and how did they connect with John Brown? 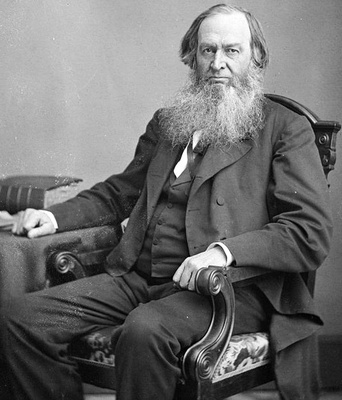 Gerrit Smith: Born into a wealthy family in upstate New York, Smith was a vigorous supporter of various reform causes, including the American abolition movement. Thomas Wentworth Higginson: A minister and author, Higginson would go on to serve in the Civil War, commanding a regiment of black troops, and would write a classic memoir based on the experience. 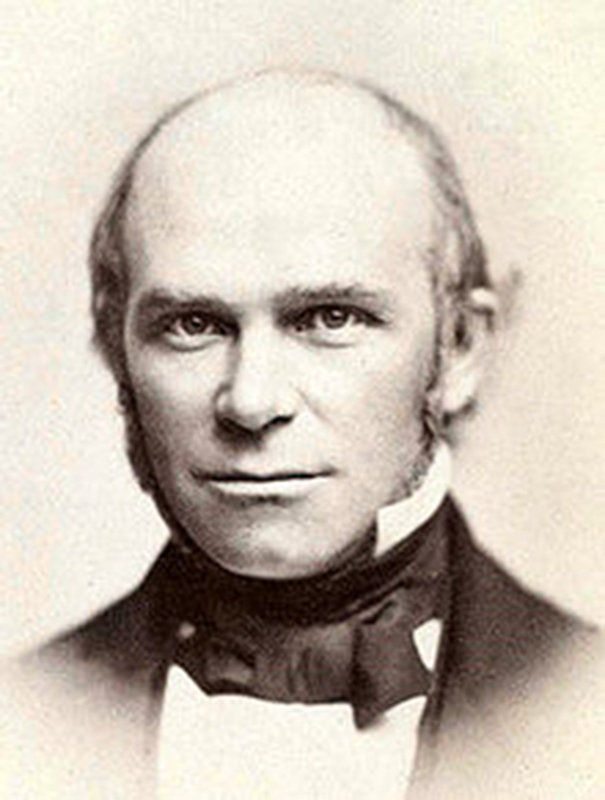 Theodore Parker: A minister and prominent public speaker on reform topics, Parker had been educated at Harvard and was affiliated with the Transcendentalist movement. 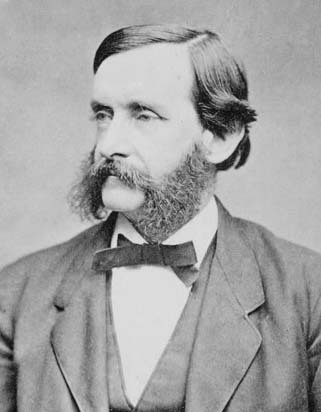 Franklin Benjamin Sanborn: A Harvard graduate, Sanborn was connected to the Transcendentalist movement and became involved in anti-slavery politics in the 1850s. George Luther Stearns: A self-made businessman, Stearns was a manufacturer and was able to financially support various causes, including the abolitionist cause. Of course with any group especially secret, they had to have something in common, and what they had in common had to be secreted in order for them to acquire their goal. In the case of these men, their goal being influenced by their Unitarian and evangelical leanings was to take over the American Government, establish their ideology which bordered on socialistic communism and become even more rich and powerful than they already were. Initially by covert means through rebel rousing lectures, writings and treatises to actually supporting with money, land and arms, a violent upheaval that would shake America to its core. And my questions was why? It turns out, they used the “Abolitionist Movement” as their front to cover their real intentions. Freeing the slaves and decrying the institution of slavery appeared noble on its face, as slavery was a diabolical institution. But as Rich Northerners the economic advantage of slavery did not appeal to them. In fact, northern whites, though some were pro slavery, were more given to the fear of the loss of jobs and income if the slaves were freed and able to travel north, so the idea was to actually split the country into two parts, pro-slavery and anti-slavery. As tensions further developed between the north and south, to them a war would settle it all. The south could keep their slaves through cession from the union and the north could continue to prosper through their more industrial business ventures. Remember, these were rich men, though some try to say they were not. But in those days, influence was equated with being rich. They were privileged radicals. 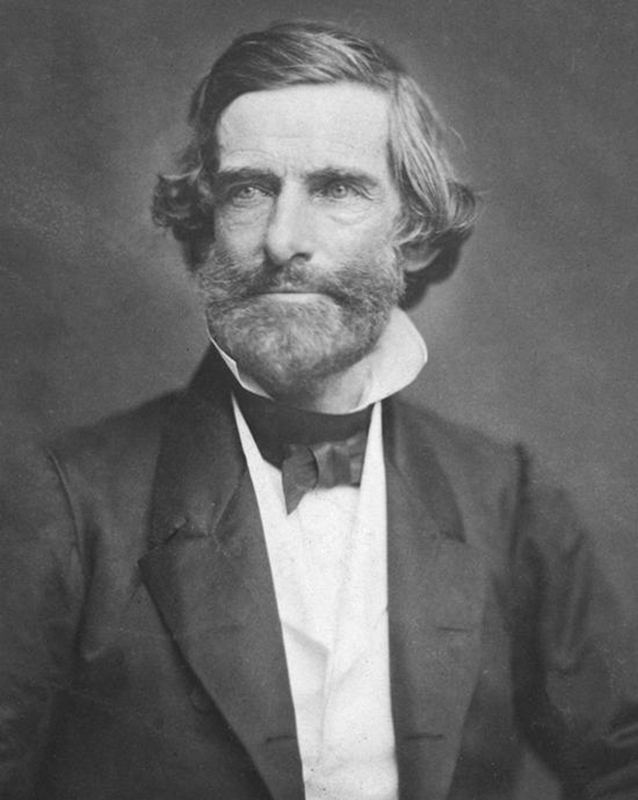 Another example of prominence was, Thomas Wentworth Higginson: A minister and author, Higginson would go on to serve in the Civil War, commanding a regiment of black troops, and would write a classic memoir based on the experience. Being an accomplished writer he lined up with the likes of Thoreau, Ralph Waldo Emerson, Lydia Maria Childs, the abolitionist author, John Quincy Adams, Amos A. Lawrence, Henry D. Thoreau, William Lloyd Garrison, Wendell Phillips, and many others. I even saw Frederick Douglas in the line up. Traveling back to those days, imagine the impact that these minds and wealth had on the thinking of the masses. Things moved a lot slower, while the printing press was heavily utilized, the transport of information to cities and towns had to be arduous by today’s standards, not to mention having a following of 7000 parishioners! So, I am inclined to think that they were quite wealthy by those standards, doctors, writers, ministers, Harvard graduate and accomplished business men would certainly have a heavy impact on the times. Theodore Parker (a minister) who during the “Bloody Kansas” period of 1854 he financed free Kansas militias, probably well aware that an undeclared civil war had already led to hundreds of deaths. Now how do you put the ministry and violence in the pulpit at the same time?? 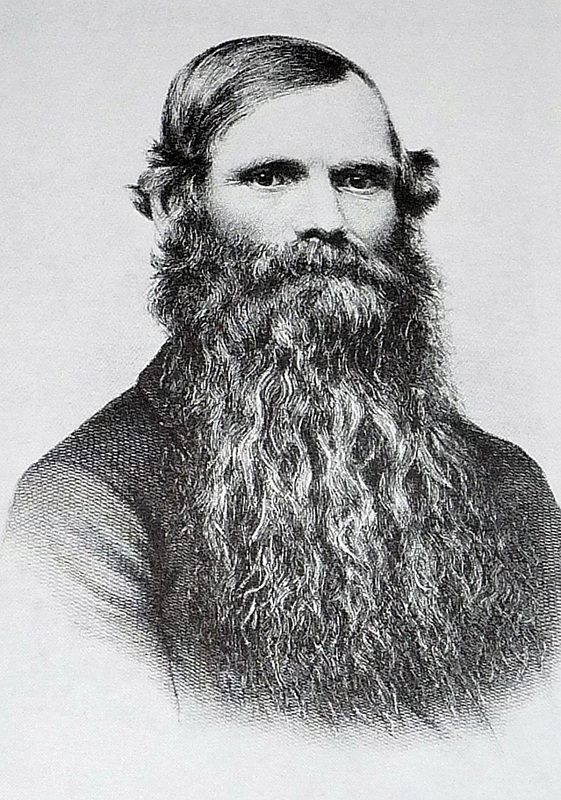 Gerrit Smith (the only New Yorker of the Secret Six) enters the story of Harper’s Ferry more than a decade before the raid, when he first made the acquaintance of John Brown. Their meeting led to a collaboration that included Smith’s financial support for Brown’s move to North Elba, NY, where he and his family established a farm with the intent of aiding black settlers who had moved to the Adirondack North Country after receiving grants of land from Smith. More than three thousand such gifts of land, averaging 40 acres a piece, had been made to poor black men. Smith sold Brown 244 acres of land ( for $1 per acre) on which he settled his family, the deed for which was transferred in November 1849. Mr. Smith was a little more squeamish about what happened at Harper’s Ferry so some claim he feigned insanity and was admitted to Utica Medical center where he remained for upwards of 6 months after the John Brown’s failed attempt to conquer Harper’s Ferry, however, others think he was really mentally ill had some mental illness in his family with a son who had been institutionalized previously, so that may be real, but with all the money he gave to John Brown, and his fugitive slaves, and the land he gave them as well, to lose that battle may have made him lose his mind as well. There’s still speculation flowing around that aspect of his life. He certainly escaped being indicted for treason by being proclaimed as insane. All to often, the “myth” of Philanthropy plays a big role as being the front for subversive, covert and sometimes violent agendas. And how true that is even today. We can see in our current world events, where many so-call charitable organizations are simply fronts for drug running, child trafficking, organ harvesting and regime change and subversion of democratically elected leaders. When you pull back the curtain, you can correlate this as well to Soros, who on its face is talking about “Free and Open Society” while in the background is funding organizations that end up being vigilantes and/or disrupting the very society they are supposedly bringing justice and peace to. Then we have Thomas Wentworth Higginson, who wrote several books that are still being referenced to to this day. (November 10, 1801-January 9, 1876), founding director of the Perkins School for the Blind, was a leading figure in the early history of special education in the United States. He was also a military hero in the Greek War of Independence, a campaigner for the abolition of slavery, and an advocate for prison reform. He worked for the mentally disabled with Dorothea Dix and for universal public education with Horace Mann. intelligent conversation, inspired Anne Sullivan, the teacher of Helen Keller. Back in Boston in July of 1832, Howe began his work with the blind by tutoring a few students in a room at his father’s house. He demonstrated enough progress that within a year the Massachusetts legislature approved $30,000 a year funding with the proviso that 20 students from poor families be given full scholarships. Then Colonel Thomas Handasyd Perkins, a prominent Boston merchant, whose fortune had been partly acquired through trading in slaves and opium, donated his mansion and grounds on Pearl Street for the school’s use. After that, the school was known as the Perkins Institution and Massachusetts Asylum (or, since 1877, School) for the Blind. What an interesting combination of characters here. Is it not? With that energy of course he would certainly support someone like John Brown. 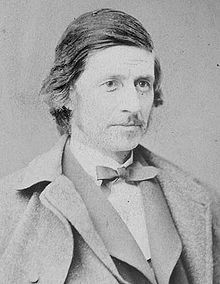 George Luther Stearns played a major role financing John Brown’s raid on Harpers Ferry on October 17, 1859. He basically maintained the accounting and funded and wrote the checks to John Brown. The Sharps rifles[ v], pistols, and pikes used by Brown’s little army were owned directly by George Stearns. He tried indecisively to control the movement and use of the weapons. 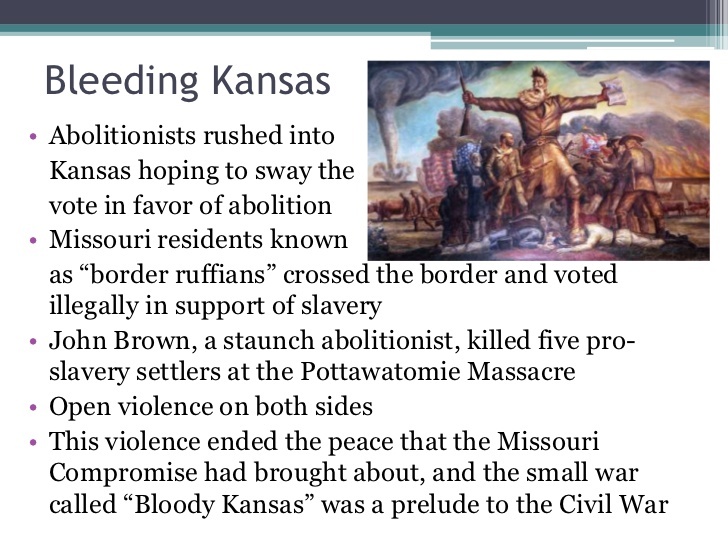 Unfortunately, he let them into John Brown’s hands in Iowa, a safe haven to Kansas, and lost control of the weapons. George’s commercial life started successful enough. He borrowed money from a close neighbor to build a Boston oil-mill[vi] with his brother. They were so successful that the loan was paid back within two years. Unfortunately, in Boston’s Antebellum period, it is near impossible to avoid tragedies fostered by acts of nature. The natural enemies were hurricanes, winter storms or careless numerous fires. Their mill burned down in 1847. This was the pivotal moment that drew George away from industry and to the cause of slavery. According to his son Frank Preston Stearns, the timing was perfect for his father. Abolitionism had moved through several philosophical stages beyond compassion to action. The decades of 1840 to 1850’s required pragmatic men to take over leadership of the movement. [vii] Here is a quote from his son that might help you judge the violent end result of his compassion. George’s son, Franklin, had a first-hand view of the relationship between John Brown and his father. Each exhibited the same contrasting, idealistic yet practical personality not the least daunted by failures in their lives. Franklin defined the first meeting between his father and Brown: “they met like the iron and the magnet. Each recognized him at first sight, and knew him for what he was worth.” Here is a practical example; Stearns grew a patriarchal beard upon doctor’s orders to warm his chest that had been susceptible to bronchitis. This was copied by John Brown. There will be a ton of links that cover this information, so I won’t go over all of it here, but be prepared to get a shift in perspective on the motives and perspective of the so called “Secret Six” and how the agenda hasn’t changed as it relates to divide and conquer but only the face of the players. So, let’s take a look at the weapons that were bequeath to our very complex and illustrious warrior who is primarily responsible for fomenting the Civil War. 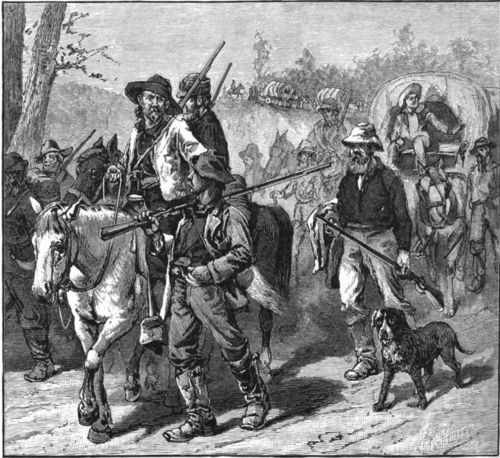 As Missouri pro-slavery “Ruffians” flocked to Kansas, the New England abolitionists bankrolled “Free-Soilers” to move to the settlement of Lawrence, Kansas. The Abolitionist, Henry Ward raised money to purchase Sharp’s rifles for use by antislavery forces in Kansas. Rifles, said Beecher, are “a greater moral agency than the Bible” in the fight against slavery. Bibles.” In 1856, after abolitionists were attacked in Lawrence, John Brown led a raid on scattered cabins along the Pottawatomie Creek, killing five people. Kansas would not become a state until 1861, after the Confederate states seceded. 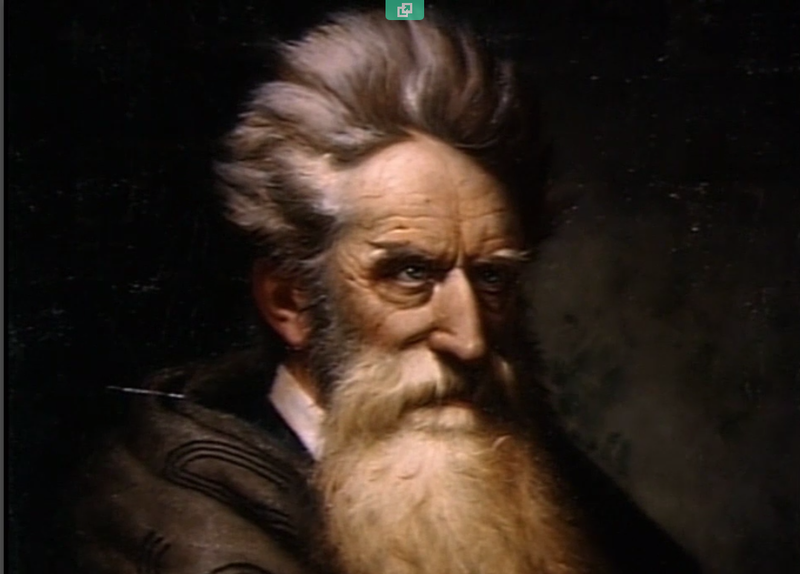 John Brown had another plan to bring about an end to slavery, a slave uprising. Brown contracted with Charles Blair, a forge master in Collinsville, Connecticut, to make 950 pikes for a dollar a piece. Brown would issue the pike to the slaves as they revolted. On 16 October 1859, Brown led his group to Harpers Ferry where he took over the arsenal and waited for the slaves to revolt. The revolt never came. Two days later Robert E. Lee and his troops overran the raiders and captured John Brown. 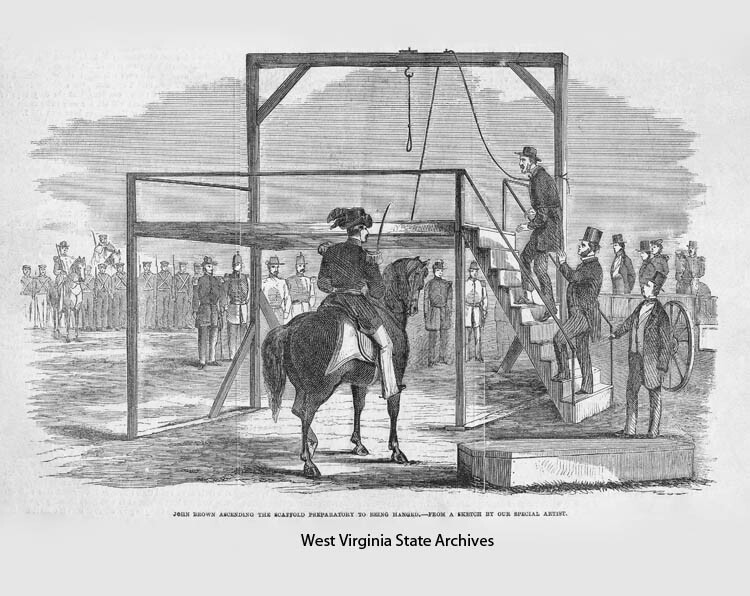 Brown was found guilty of murder, treason, and of inciting slave insurrection and on 2 December 1859, he was hanged. Now some say, that the weapons were primitive and basically useless however these weapons have been hailed as of high quality, auctioned off, those that were retrieved and are quite costly to own. 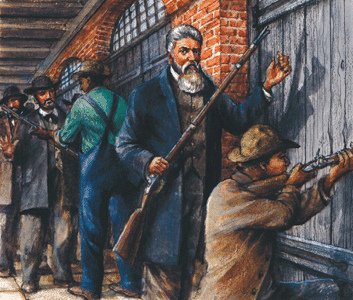 John Brown came to Harpers Ferry in part to capture firearms from the national arsenal that he hoped to eventually place in the hands of slaves. Not many people realize though that he and his men arrived at Harpers Ferry quite well armed already. For his attack, Brown would choose several weapons to arm his men, some of which were the most advanced of the day. In 1857 Brown had been given 200 Sharps rifles by the Massachusetts Kansas Committee. These rifles were unlike the common muzzle loaders of this era and had become quite popular with the antislavery free-staters in the Kansas wars. Some of the Sharps were given the name “Beecher’s Bibles” because a number of them had been sent out to the plains under the auspices of being boxed Bibles, and had been praised by the abolitionist preacher Henry Ward Beecher for their effectiveness in combating the pro-slavery Missouri forces. 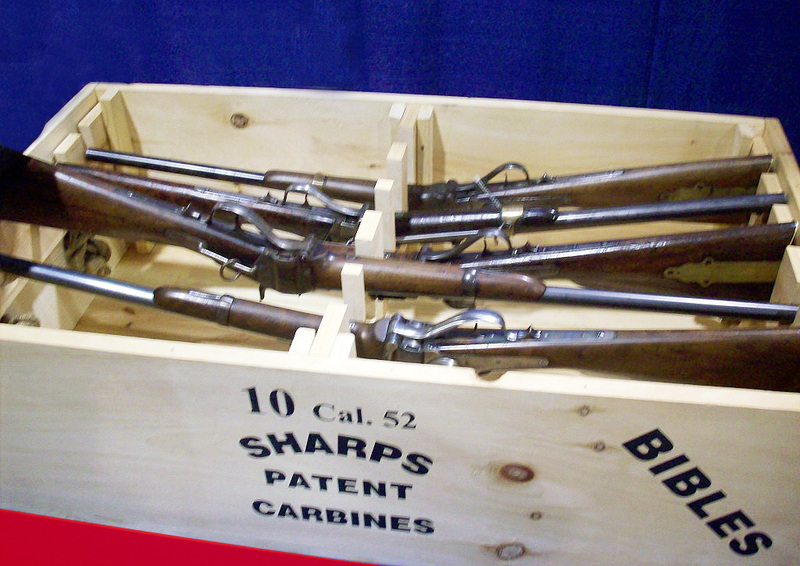 The 52 caliber breech loading Sharps rifles were invented by Christian Sharps, were produced in Hartford, Connecticut, and were one of the most accurate and fastest firing weapons available. Brown’s most well recognized weapons were pikes (pictured top). 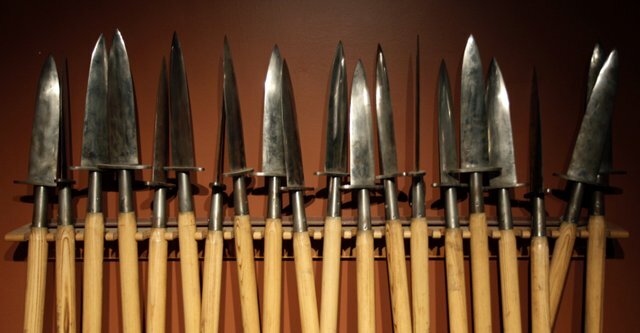 These fierce spears had ten inch double-edged blades attached to six foot long ash handles, and were manufactured by Connecticut blacksmith Charles Blair. Brown had contracted with Blair while on the same fund raising tour to the East in 1857 that had earned him the Sharps rifles. Brown thought these lance-like weapons would make intimidating tools for the free state settlers in Kansas to keep Missouri border ruffians at bay. Brown signed a contract with Blair to pay him $1 per pike for 1000 pikes. Brown was unable to pay the required full amount before returning to Kansas so they remained in Connecticut until 1859. The other weapon Brown was supplied with was the 31 caliber Maynard pistol. These revolvers were produced by the Massachusetts Arms Company in Chicopee Falls and used a special tape-roll percussion cap that looked much like the cap rolls used by cap guns today. Unfortunately for Brown, the 200 Maynard pistols arrived at the Kennedy Farm without the proper percussion caps and were thus useless to him and his men. Weapons that have provenance to John Brown’s raid are some of the most sought after by serious collectors. Recently one of the John Brown pikes sold at auction for $13,000. Other pikes are in the museum collections at the Museum of the Confederacy, Harpers Ferry National Park, the Smithsonian, and the Kansas State Historical Society. The National Firearms Museum and the Smithsonian also have some of Brown’s Sharps rifles as well. So what we see happening here, is the arming of a band of terrorist who were willing to risk their lives to counter slavery during the mid 1900’s. Or that is what it would appear to be without further investigation. However, when we look closely we can see that there certainly was an underlying agenda pack way deep into this event. Of course, it goes without saying that the enslaved Africans wanted freedom. But an armed rebellion may not have been the caliber of exacting freedom that was most prominent in the minds of most Africans. On the other hand, the pro-slavery contingent were facing the total annihilation of their economy, the loss of land, resources and particularly “free labor” that had given them quite a nice slice of America’s apple pie. Surely their battle to preserve the institution of slavery was based in economics and not humanitarianism, in fact, neither was the Abolitionists who condoned and resorted to violence. Using slavery or the abolition thereof was just a smoke screen for a deeper and even more sinister plot. The Cabal of the Secret Six are so familiar to our modern day cabal it is cringe worthy. Imagine the idea of “arming the rebels” being something that occurred over 160 years ago. Imagine it being done by rich philanthropists, teachers, doctors, ministers and other folks with interesting connections to people who participated in the Slave and opium trade. Imagine the arrival of a haughty anxious and sometimes bellicose figure, who could rally the masses to commit suicide for a cause that even he himself had no idea of the real agenda behind it. Imagine the atrocities committed on both sides as human beings battle for disparate causes all believing their cause was correct and the other’s not but each of them standing on the foundation of fear and trepidation that if they failed, they would face annihilation. But take it a step further, that after the horrendous path of death and destruction paved by John Brown, the Secret six the Missouri Border Ruffians, we get monuments, honored grave cites, plaques, and honorary mention of these “terrorists” in the annals of history. 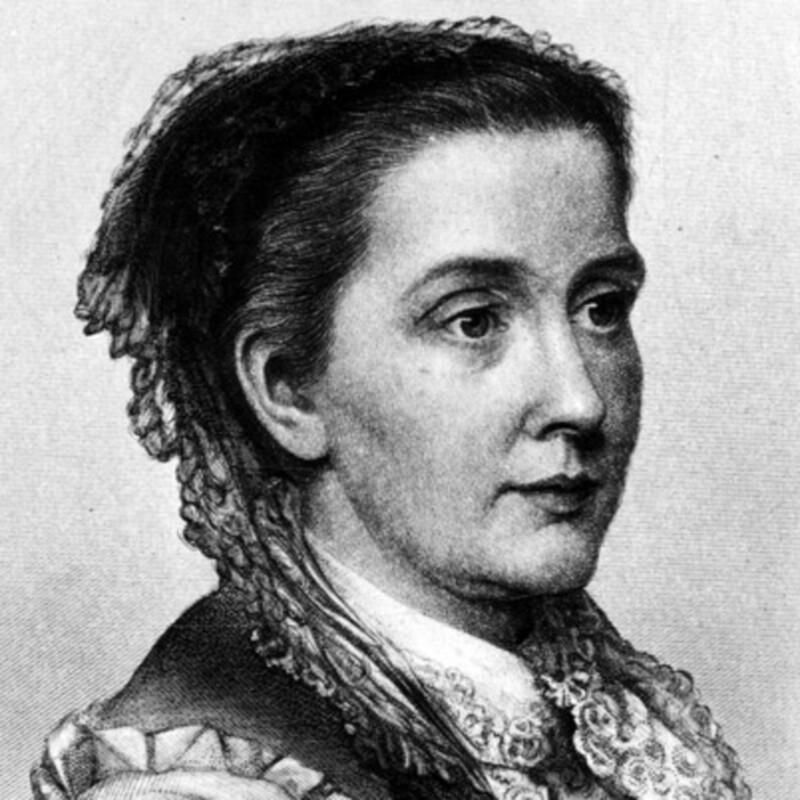 Howe’s wife, Julia Ward Howe, was commissioned to change the words of the song, which ultimately became the battle cry of the North and is still sung as one of the most Patriotic songs of the United States. And what song might that be you may ask? Drum roll, The Battle Hymn of the Republic. An we think that we live in ironic times!!!! Needless to say, John Brown’s attack on Harper’s Ferry failed. He had delusions of grandeur and might that would leave him in utter shame being charged with treason. He took the brunt of the whole conspiracy until it was further revealed that he had wealthy backers, each of whom fled after Brown’s defeat. 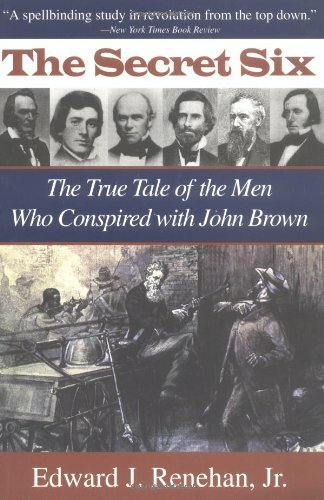 Brown was hanged on 2 December 1859, Howe and Stearns had fled the country, Parker was dying of consumption in Italy, Sanborn couldn’t make up his mind whether or not he ought to flee, Smith was in an insane asylum, and Higginson was planning a half-cocked (and never pulled off) plan to rescue Brown’s still imprisoned companions in the crazy raid on Harpers Ferry. During his raid, Brown and his men had captured a number of slave owners in the area, including Lewis Washington, the great-grand-nephew of President George Washington. Brown did not kill any of these captured men, and he went out of his way to protect them and make sure they were not harmed. While in Harpers Ferry, the raiders killed a railroad baggage handler, who ironically was a free black, when he refused their orders to halt. In a firefight they killed a few townsmen, including the mayor. At one point Brown stopped a passenger train, held it for a while, and then released it. The train continued on to Washington, D.C., where the crew dutifully reported to officials that Brown had seized Harpers Ferry. The next day, October 18, U.S. marines, under the command of Army Brevet Col. Robert E. Lee, captured Brown in the engine house on the armory grounds. By this time, most of the raiders were either dead or wounded. The story of these six avid enemies of slavery- writers, preachers, businessmen is not just an obscure tale about the would-be financiers of a revolution; it is also the story of pacifists turned radicals, of hope for slavery’s extinction being shattered by deep societal and economic currents, and of inspired citizens planning a stand against fundamental evil only to flee the country and deny their involvement after Brown’s failure. 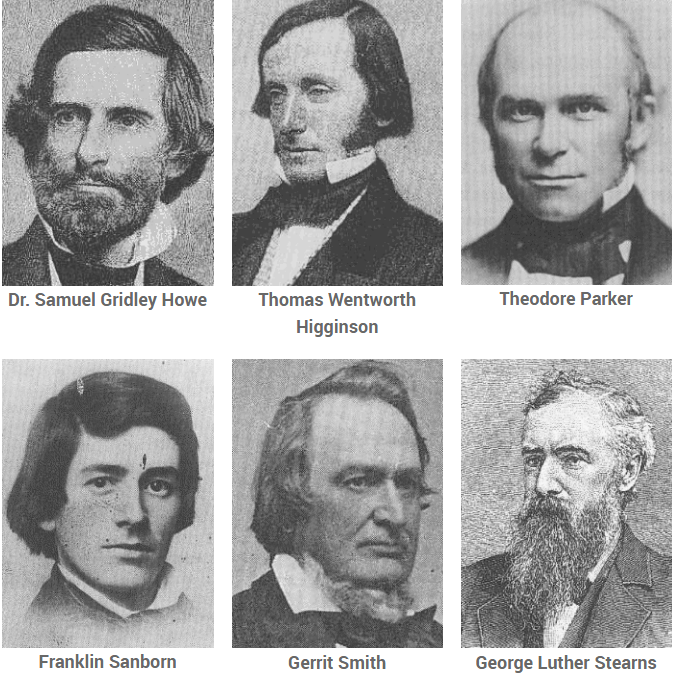 The Secret Six were not hardscrabble ruffians or ex-slaves but men of culture, education, and fortune, and, as such, an especial threat to the slave- holding plutocracy Five of the six were from Boston: Higginson a preacher and a writer; Sanborn a young writer, teacher, and protégé of Ralph Waldo Emerson; Howe a world- renowned physician who worked with the blind and deaf; Theodore Parker a well-known abolitionist and Unitarian preacher; and George L. Stearns a prosperous manufacturer. The sixth member, Gerrit Smith, was a rich upstate New York businessman and philanthropist. So there you have it folks. What a ride! And I do hope that you got another wrinkle in your brain.